This Vegetable Biryani recipe is a rice recipe that is cooked on special occasions such as festivals, parties, celebrations. Biryani is also spelt and pronounced as biriyani. It is a special rice and vegetables dish. Dry fruits, spices, herbs and yogurt are used along with rice and vegetables. 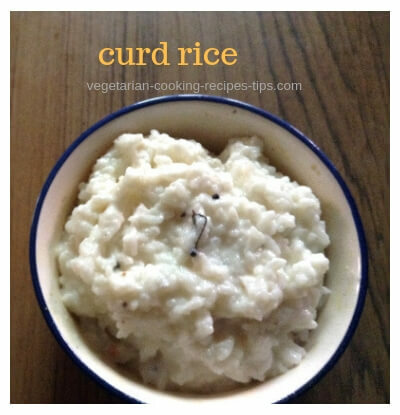 The vegetables include capsicum, cauliflower, carrots, potatoes, green peas. It can be a one dish meal too. 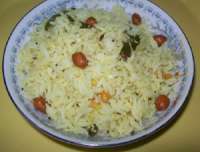 Vegetable biryani is different from vegetable pulao. 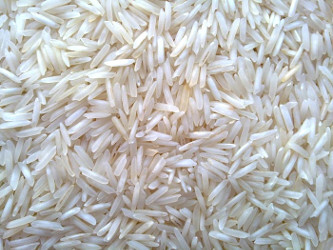 When you make pulao, rice is cooked with vegetable and spices. When you make Biryani, you cook the rice and vegetables separately and then both are cooked in a oven in dry heat. The taste pulav and biryani different because of this. mixed vegetables - 2 cups boiled till just done. Cook the rice till just done. 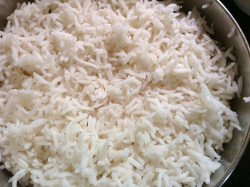 Each grain of the cooked rice should be separate. Drain and cool. Soak saffron in little hot milk. Heat the ghee/oil and fry the cashew nuts, remove onto a plate. Add the onions in the same ghee, fry until brown and crisp. Drain and remove. Add raisins and fry for a few seconds. Remove and keep aside for garnish. In the same ghee, add the ground paste and fry for 3 to 4 minutes. Add the tomatoes and fry again. Add the yoghurt and fry till the mixture thickens a bit. Add the boiled vegetables, coriander and cook for 5 minutes. Spread half the rice at the bottom. Spread half the vegetables on it. Sprinkle half the saffron, half the onions, half the fried nuts. Repeat with the remaining vegetables, rice, saffron and nuts. Dot with butter. Cover and bake in a hot oven for about 15 minutes. Otherwise you can also layer the vegetables and rice in a pan with a tight lid and keep on a very slow flame for 10 minutes. Serve hot with cucumber raita, tomato raita and papadam. 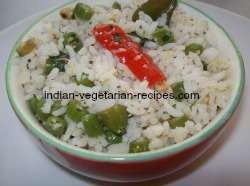 I am sure you and your family will enjoy this vegetable biryani recipe.